The details given here are for the construction of a box that will carry six British Standard frames, this enables such carrying as an additional capability to the main design features. As the bees will not be kept in the box for extended periods it is not important to adhere to normal bee space practice. The basic internal dimensions of the box are 434 mm x 216 mm, if you are using frames other than British Standard you will need to adjust the length to suit your top bars. The material used for the walls and funnel parts is 9 mm thickness waterproof exterior grade plywood which is adequately rigid. Although this type of box is heavier than the standard version it will only be used as a carrying box on a few occasions, but such a carrying facility is still useful to incorporate. The frame runners should be the same as those detailed on the page that covers the standard version. Depending on your precise design, it may be possible to use the frame runners to lock the bolt heads in place instead of using separate blocks. No 4 Woodscrews and PVA glue are used for construction. The body of the box is made 240 mm deep inside (from rim to mesh) similar to the standard version. The opening hatch side of the box overlaps the base by 9 mm. The ends overlap the base by 43 mm. The funnel side does not reach the base, but has a panel of queen excluder fitted. Depending on whether this is a perforated sheet excluder or a wire one, a fillet of 8 mm or 6 mm will be needed to cover the board slot and as a spacer for the strip that acts as a mount for the piano hinge. The fit at this point is critical and should be adjusted by planing or application of cardboard spacing strips in order that the piano hinge mount's outer face is exactly as proud of the body as the upper portion of this side. The top curved edges of the quadrants may require relieving where the toggle fasteners are fitted. The funnel and its end quadrants are also 9 mm ply with the inside measurement of the funnel 1.6 mm to 2 mm longer than the box side so that it opens and closes without dragging. The action of this opening and closing is made easy and smooth by using plastic spacer washers as shown. The wing nuts and the bolts that act as studs can be brass or stainless steel. The bolts are held captive and are stopped from rotating by sinking the heads into wooden blocks that are themselves glued and screwed to the inside of the box. The hexagonal recess is easily formed by drilling a blind hole that has a diameter the same as the 'across the flats' dimension of the bolt head. The bolt head is placed on the recess and a mallet blow will leave an impression of the hexagon, which can be carved out using a chisel. The quadrants can be marked out with easily using a trammel formed from a strip of 5 mm ply with a pivot hole at one end and three other holes that will accept the point of a pencil. These three holes are the inner and outer edge of the curved slot and the outer edge of the quadrant itself. The quadrant is made much wider than required just for opening, so that the curved slot is not exposed when the funnel is open. This stops light entering via the slots and avoids the complication of bees getting in the way when you wish to close it. 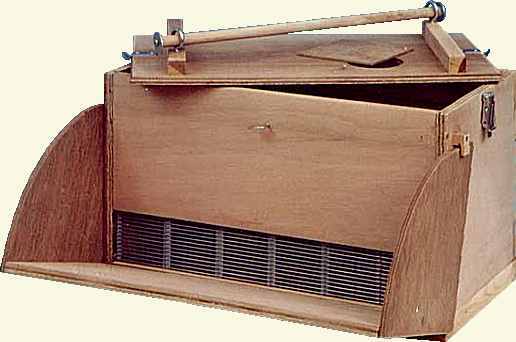 Continuous 'piano' hinge is used instead of separate hinges so that the absolute minimum of light is admitted to the bottom of the funnel. In order to keep this portion of the box as dark as possible it is also recommended that the inside of the funnel be painted with blackboard paint. The side opposite the funnel has it's own set of features. The majority of the area is an opening hatch or trap door and there is a further trap door within the confines of this outer one. The smaller door is backed by 8 mesh and can be opened as a ventilator. On one I made many years ago I painted the legend "Live Bees" on the inside of flap so that it was visible when it was open. 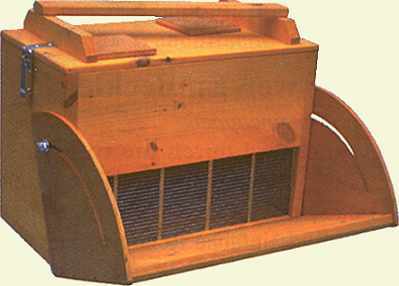 The larger door can be used to scoop bees out of the interior of the box using a plastic drinks machine cup or a scoop made from a plastic milk container. I used brass hinges and two more toggle catches to complete this feature. The two trapdoors are cut without wastage, using a fret saw, from one solid sheet of ply. The pilot holes for this are drilled under the hinge positions so that they do not show. A strip of 5 mm ply was fixed inside the top of the opening of the larger trapdoor to act as a stop so that it did not travel too far and sprain the hinges. Spare pieces of piano hinge could be used, instead of the brass ones shown. A simple entrance with closure plate can be fitted to one or both ends (as detailed on the standard version). A slimmed down version of the drawbridge type of entrance could also be fitted, being mindful of the closed position of the quadrant. Some of the details on the page that deals with the construction of the standard swarm collecting box are relevant to the construction of the Marburg version and should be consulted along with the other documents linked at the top of the page. The wing nuts, toggle catches and hinges even if they are brass or stainless steel, will benefit from the application of a little Petroleum Jelly. I have used linseed oil to preserve the wooden parts, but this is a piece of beekeeping kit that may well be used at demonstrations and will look really smart with a coat of polyurethane varnish. Since writing this page I found an illustration of one in a German Catalog (They are on the net, but their site did not include it, when I looked... I will put the details here when it is working). It is only available in German National or Zander sizes, but it takes six frames, the same as mine. The view shows the box with the funnel wide open. Both of these illustrations show the funnel at a more open angle than I personally use, I like the shallower angle because it makes the bottom of the funnel darker and the bees are more likely to go through the excluder. The version at right could benefit from the addition of strings to limit the opening of the funnel, in a similar way to that shown in the version illustrated below. 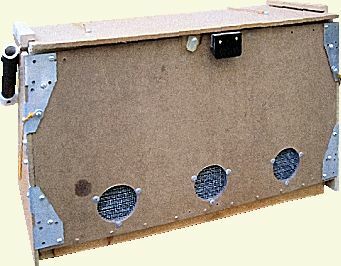 This home built box was made by a beekeeper in California who signs himself 'JP' who mentioned that an additional use for the box is a means of finding the queen. When frames out of the brood nest are shaken over the funnel the queen is left behind, because she is unable to enter the box through the excluder and attracts a bunch of bees that cluster around her. The ventilation holes shown in the version illustrated at right are placed to line up with the queen excluder grid in the inner wall. The string prevents the lid dropping down and although JP claims that it is not elegant, it allows him change the angle easily. The chute is wide open when picking up a swarm and narrower when shaking frames. To my mind the elegance or otherwise is of no importance, it is adequately functional, which is what matters. My Email dialogue with JP has made me realise that my usage of the box may not be typical. When using the box to collect a swarm I just take the lid off and throw them straight in, without using the funnel. My main use of the Marburg box has always been obtaining young bees for mating nucs or cell raising boxes.